Since I participated the 3 Days of Paranormal Fun, my mail box has been flooding with new author aquaintances and free e-books, mainly in shifter genre. Krystal Shannan is a productive writer and she has also published under the name Emma Roman. Chasing Sam is the first in the Vegas Mates series. The book was interesting enough so that I’m going to read more of the Vegas Mates. Shifters are definitely interesting and now that I have my e-reader full of new books,I want to find out how the aspects of the genre vary between the authors. 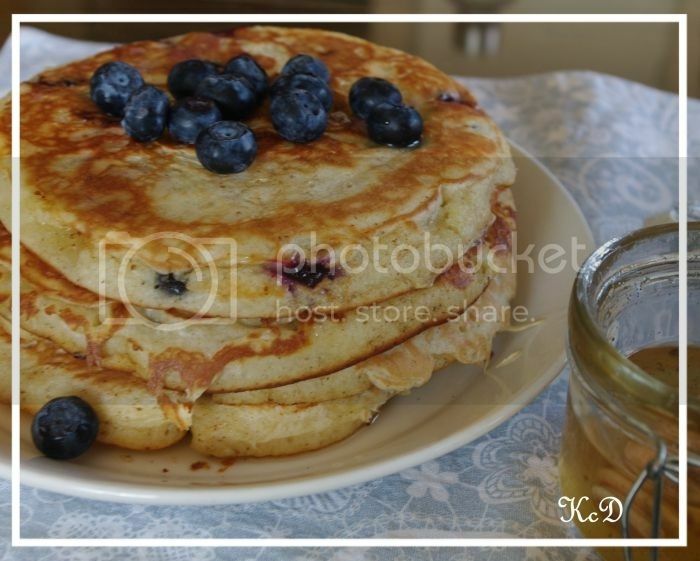 The blueberry pancakes… they represent something very American to me, I mean the thick pancakes in general. I’ve never eaten them but when they were mentioned in the book, I knew I had to make them. A five-minute cab ride landed them right outside Joe’s. Chase climbed out and then opened the door for Sam to step out. He took her hand again and led her inside the 24-hour diner. They sat at an empty table and a waitress plopped a menu down in front of Chase. The old lady laughed in his face. Even Sam giggled. He had a feeling he was mising a joke. 1. Take two bowls. Mix the dry ingredients in the other and the liquid ones in the other. 2. Sieve the dry ingredients into the liquid mixture and whisk the mixture to gain even consistency. Fold in the blueberries and set the batter aside for an hour. 3. Heat a frying pan over medium high heat. Because the batter contains sugar, it browns quickly, so to avoid burning / uncooked batter, don’t set the heat too high. 4. Melt some butter on the pan and scoop the batter onto the pan. When the surface starts to bubble, it is time to flip it over. Chasing Sam is the first in Vegas Mates – series by Krystal Shannan. It’s about old tradition among upper class werewolf families – the mate hunt. It takes a short encounter in the airport for Chase Michaels and Samantha Demakis to recognize each other as their one and only mate. This instant mate thing bothered me a bit. I would have liked more depth and backstory to the characters before going into this mate mood. Though Chase and Samantha know that they’re meant to be, they’re not getting their HEA without a fight. Chase has to participate the hunt and he will fight to win, even if he might die trying. Samantha hates being a trophy but her parent’s are adamant, this is the only way for her to find a mate worthy of her status and pedigree. Shannan writes well. I had to keep reading to find out what happens to the characters. I found the character’s inner dialogue with their wolves within little schizophrenic. Isn’t the wolf supposed to be same with the human? Now it seemed that the wolf side of the characters were different entities entirely. The story was entertaining, and I will definitely read more Shannan’s books.